Breast pain is described as any feelings of discomfort, tenderness, or soreness in one or both breasts. The primary cause of breast pain in young women is hormone fluctuations experienced during menstruation and puberty. Breast pain can include sensitivity, burning, swelling, or dull, achy pain. There are two types of breast pain, cyclical and non-cyclical. Cyclical breast pain is linked to hormonal fluctuations, making it the most common. Non-cyclical can be caused by medical factors like breast cysts and previous breast surgery. It is important to understand the common causes of breast pain, and subsequent helpful treatments. Keep reading to learn more about breast pain young women. As previously mentioned, the primary cause of breast pain in young women is hormone fluctuations - specifically estrogen, progesterone, and testosterone. These hormone changes cause inflammation of the breast tissue, which causes pain. Young women are the most susceptible to cyclical breast pain because they experience hormonal changes every month during menstruation. However, women of all ages are vulnerable to breast pain. Additional causes of breast pain can include lifestyle factors or medical conditions. Lifestyle factors like poor diet, insufficient exercise, and excessive stress can cause breast pain. Medical conditions that may cause breast pain include previous breast surgery, breast trauma, and breast cysts. Stress is a common trigger for breast pain. It is important to try to manage stress as much as possible for your overall well-being. Yoga, meditation, and regular exercise are all excellent stress relievers. It may also be helpful to take time alone to read, listen to music, or take a soothing bath. Applying cold compresses directly to the breasts, taking a warm bath with essential oils, and wearing loose cotton clothing are all helpful tips to help ease breast pain. Herbal remedies are a safe and cost-effective alternative to treating breast pain. Two popular herbs for treating breast pain are evening primrose oil and soy. Evening primrose oil is anti-inflammatory, and has been helpful in easing menopausal breast pain. Soy has been a popular herb among menopausal women because of its phytoestrogenic compounds. The British Journal of Sports Medicine published a study about the connection between exercise and breast pain. It may seem counterintuitive to exercise to reduce breast pain, but it provides life-long benefits. Scientists say ill-fitting sports bras are a main cause of breast pain during exercise, so be sure to get properly fitted before working out. Exercise has been shown to significantly increase energy, improve mood, as well as the efficiency of the heart, muscles, and joints. Breast pain is a troublesome menopause symptoms that affects around two-thirds of women. It can range from mild to severe, and last anywhere from several hours to several days. The most common cause of breast pain in young women is hormone fluctuations experienced during menstruation. It is important to stay active and maintain a healthy diet, as well as trying herbal remedies and cold compresses to reduce breast pain. Are Home Remedies the Best Treatment for Breast Pain? 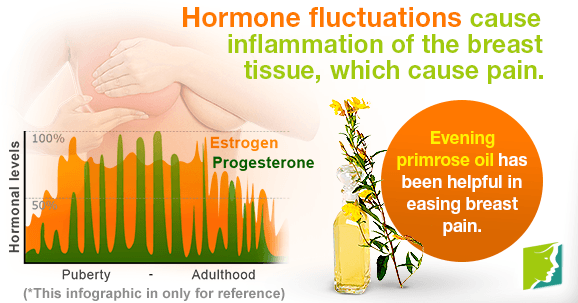 Can Hormonal Imbalance Cause Breast Pain? Read all about left breast pain, including its possible causes and how to deal with it, so that you can start enjoying a symptom-free life again. Women should not be worried because the uncomfortable breast tenderness symptoms and hypothyroid problems can be treated once diagnosed. Women experience hormonal changes during the menstrual cycle and menopause, which can cause breast tenderness. Read on to learn more.